One of the main driving forces behind users performing a jailbreak on their iOS device is the fact that it gives the ability to modify the feel and appearance of the operating system. As a company, Apple are a champion of innovative design and their current range of hardware is amongst the most beautifully designed out there, but a growing number of users feel the need to modify the stock interface elements to better suit their individual tastes. As jailbreaking has grown in credibility and popularity over the years, so has the development community which routinely supports that growth. For users who require aesthetic modification to the stock operating system, they currently have the option to theme the OS using powerful platforms such as WinterBoard or DreamBoard which rely on artists and designers creating compatible themes. If users required more subtle modifications to things like the application icons then using the popular Barrel tweak by Aaron Ash or the Graviboard tweak by Conrad Kramer could prove a viable option. Barrel has been one of the great successes in the last twelve months and not only has it put the developer in the community limelight, but it appears that it has also inspired other developers to create tweaks based around its core functionality. One of the latest tweaks to hit the Cydia platform in the last few days is known as WeeRoll Lite and as you might guess from the name is yet another Notification Center Plug-in. However, WeeRoll differs from other NC plug-ins in the fact that it doesn’t function as an information based widget, but exists to offer different transitions which occur when Notification Center is invoked. After installation, WeeRoll Lite makes its mark upon the device by adding a dedicated preferences panel in the default settings application. Something that WeeRoll Lite has, which not a lot of developers used to do, but that I am glad to see becoming something of the norm recently is the addition of an on/off toggle which allows users to render the tweak inactive without needing to uninstall through Cydia or change preferences through the Mobile Substrate options in SBSettings. 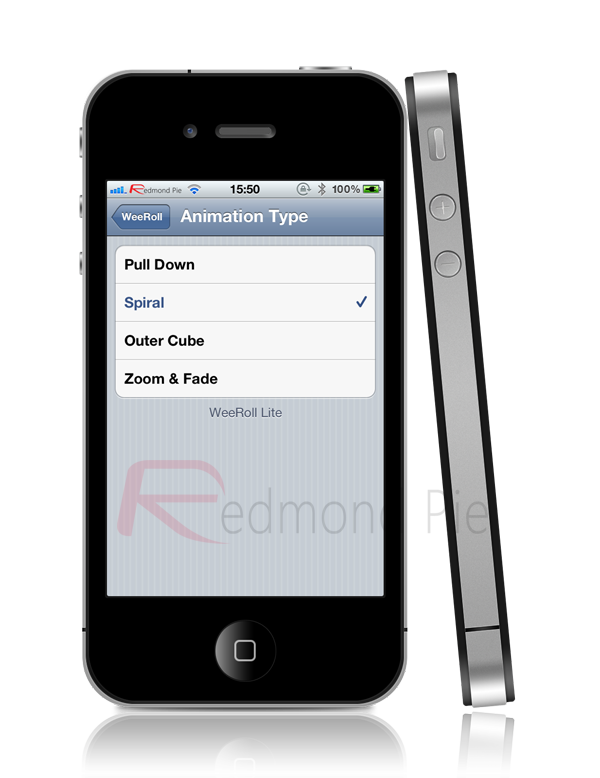 An extra option for ‘Animation Type’ is also present in the settings panel which is where users can select their chosen transition style. All in all, WeeRoll Lite is a tweak which relies heavily on the as to whether or not the individual wants to change the Notification Center transition style. It doesn’t offer any ‘must have’ functionality, but is a very accomplished and professionally implemented piece of work and considering it is free of charge is definitely worth trying just to see the transitions in practice. 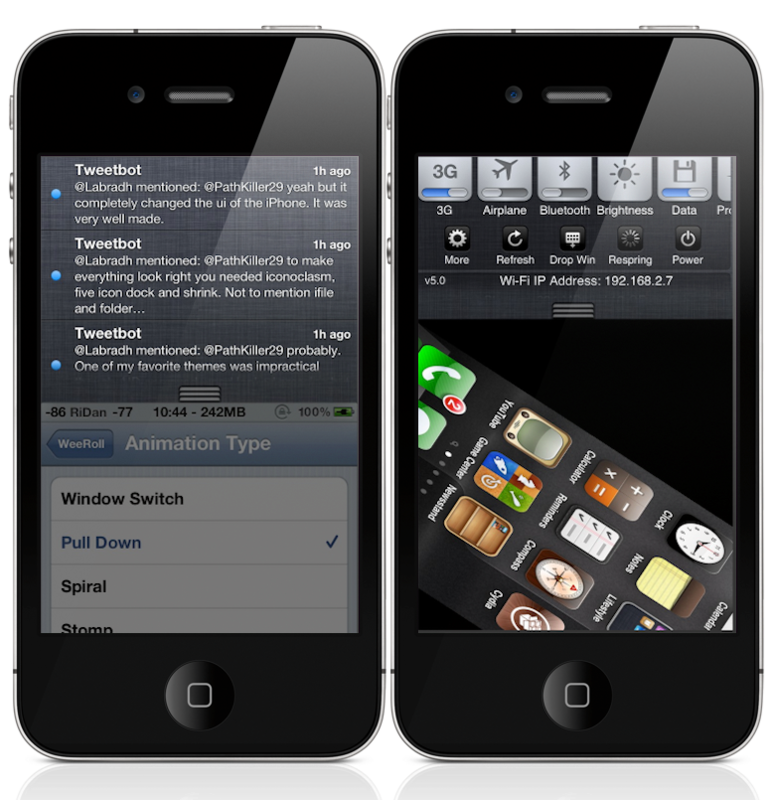 WeeRoll Lite is available free of charge from the ModMyi repository and requires a device running iOS 5 or above.